Artists like Rembrandt Harmenszoon, Vincent van Gogh, Willem de Kooning, and many others popularised the impasto painting technique with their thick consistencies and fine knife strokes. Today, an Indian visual artist Nandita Richie is diversifying the art form into ‘wearables’, introducing something new to both fashion and creative art markets. 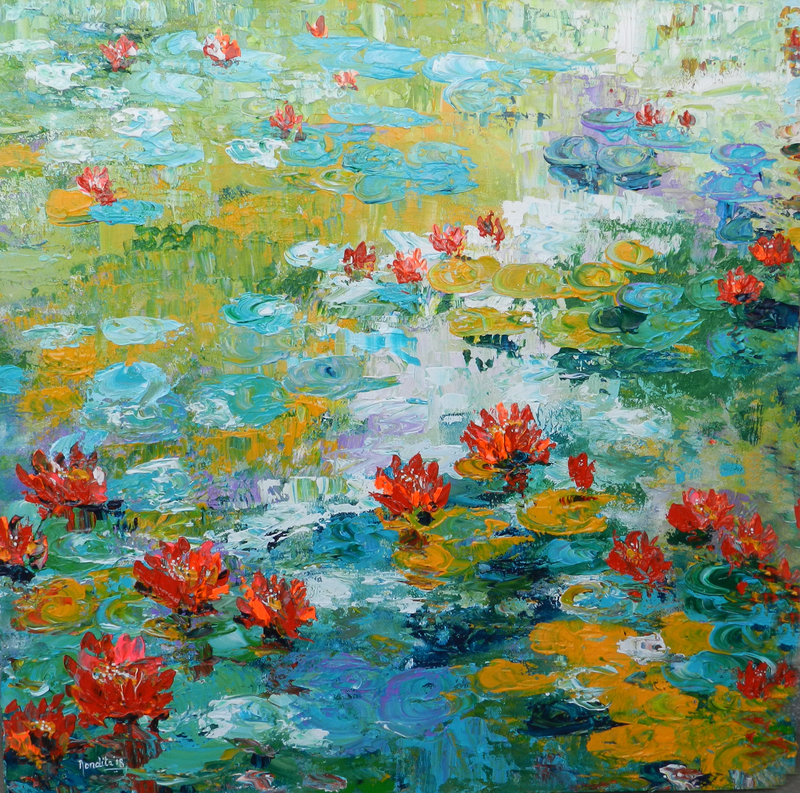 Amidst green and yellow leaves, lay white, pink and red lotus flowers painted with splashes of deep pale colours bringing out vibrancy and texture using the impasto technique. The word ‘impasto’ traces its origin as an Italian word meaning ‘paste’. It is a technique used while painting, where paint is laid on the surface of the canvas in very thick layers. When dry, impasto provides texture and the paint appears to be coming out of the canvas. As a visual artist, some of the influences for Nandita Richie have been the impressionist, post-impressionist and expressionist art styles that can be easily identified in her works, though she also focuses on modern and contemporary art. Richie works with the ‘wet on wet’ technique and paints her canvas inspired by nature – with the velvety petals of flowers or the depth of water. “Most of my recent work comprises of a series of florals and waterscapes on canvas that are all inspired by my grandfather’s garden where I would spend a lot of time when I was young. Bougainvillea and bright yellow amaltas, sunflowers, lilies, etc. blooming in the summer months in India take me back to the memories of relaxed summer holidays of my childhood that I spent with my grandfather in his garden in Jaipur,” she tells Media India Group. While painting with impasto, raised surface of the colours causes light to be reflected in new ways that the artist can control. The paint is overlapped to mimic the broken textured quality of highlights, i.e. the surface of objects that are struck by intense light. Expressionists, notably the Dutch post-impressionist painter Van Gogh, used impasto to convey feelings and emotions. The impasto of modern contemporary painters like Vincent Van Gogh or Jackson Pollock reflects an emphasis on gesture and the physical presence of paint itself. Interestingly, impasto can convey a three dimensional impression. Baroque painters like Rembrandt Van Rijn and Diego Valazquez etc., who used to work with the impasto technique showed aged wrinkled skin or the folds in robes or the reflection of jewels or armour through application of this technique. These rough textures can draw attention to certain points or aspects of a composition in a manner that is not used by painters generally. 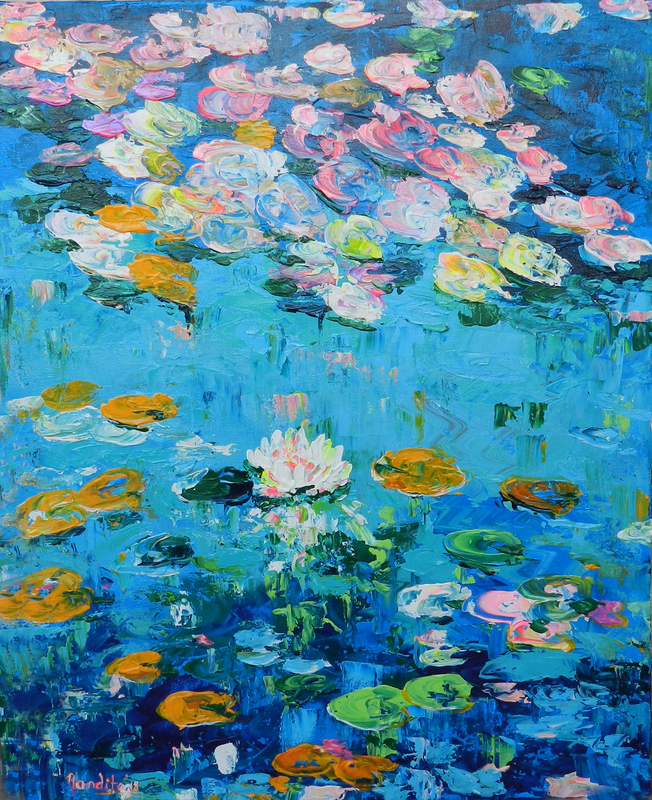 As for Richie, she explains why the lotus flower has been pivotal in her paintings. “Lotus in many religions like Buddhism symbolises strength and overcoming ones weaknesses, struggles and still shines in spite of being in muddy water. I feel connected and get continuously inspired by it and thus it is my favourite muse,” she says. An Arts graduate from Delhi, Nandita began her life as a designer in the advertising world. In a bid to enhance her designing skills, she went on to study graphic designing and multimedia. This gave a deeper edge to her designing skills and sharpened her vision to introspect on what she wanted to bring out through her master strokes on to the canvas. At the age of 14, Richie painted a few sarees for her mother with fabric dye paints to try new ways of expressing her art form. Today, she has diversified her art into ‘wearables’ and owns her signature line of ties, scarves and pocket squares. She will be starting her own line of sarees soon. “I believe art should not be limited to art galleries and only for those who can afford to buy original art. In my effort to reach out to a segment that would like to own some creations, I wanted to explore other options and mediums where I could take my creativity. Bringing out my line of designer silk scarves, ties and pocket squares seemed one of the best options. These products are limited edition prints of my canvas art and they are affordable. Art lovers who want to own a piece of art but cannot afford originals can buy art and also wear it in form of a fashion statement. The wearables will be soon available on my website. As of the moment, most of the sales are done through my contacts and social media platforms like Instagram and Facebook,” she says. Richie has been previously invited to participate in the group show ‘Colours de l’inde’ in Nice, France in 2010. The theme was ‘India’ and two of her works were selected along with artists from all over the world. “Being invited to participate in a group show in Nice, a beautiful port city near the fashion capital of the world Milan was a wonderful experience. For me it was a valuable opportunity to interact with artists not only from France but also from the USA, the UK and other countries. In the more recent front, my creations are selected for Art Asia 2018 organised by Asia Art Net committee and sponsored by the South Korean government, scheduled for the month of November in South Korea,” she informs. Great work expressed in words Nandita.